Just 80 km south of Mexico City, Tepoztlán, is a magical town full of mysticism and tradition that, despite its small size, is world famous and a source of pride to its inhabitants. 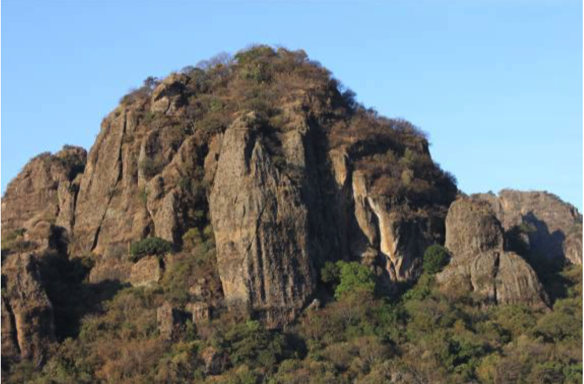 El nombre de Tepoztlán es una palabra que se deriva de la lengua náhuatl y que viene de Tepoztecatl (divinidad nahua) y tlan (junto a), por lo que su significado es: "en compañía de Tepoztécatl". Algunos autores piensan que significa "Lugar del hacha de cobre" o "Lugar de las piedras quebradas", posiblemente como referencia al hacha que formaba parte del atuendo del dios tutelar del lugar, llamado Ometochtli-Tepoztecatl. Según Adriano Ortega Sánchez, el símbolo del Hacha de Cobre (Tepoztli) y el Cerro (Tlan), es la connotación simbólico silabico (glifo fonético), del Códice Mendocino (la palabra Tepoztlán procede de la contracción de las palabras Tepetl Poztecqui Tlán (Tepetl, Montaña; Poztecqui, escultor, escurpir; y de Tlán, Lugar). The name of Tepoztlán is a word that is derived from the Nahuatl language and that comes from Tepoztecatl (Nahua divinity) and tlan (next to), so its meaning is: "in the company of Tepoztécatl". Some authors think that it means "Place of the copper ax" or "Place of the broken stones", possibly as a reference to the ax that was part of the attire of the tutelary god of the place, called Ometochtli-Tepoztecatl. According to Adriano Ortega Sánchez, the symbol of the Copper Ax (Tepoztli) and Cerro (Tlan), is the syllabic symbolic connotation (phonetic glyph) of the Mendocino Codex (the word Tepoztlán comes from the contraction of the words Tepetl Poztecqui Tlán (Tepetl –mountain- , Poztecqui -sculptor, sculpt- , and Tlan –place-). Today, Tepoztlán is a peaceful and quiet community of 35,000 habitants with a strong local cultural heritage (a microcosm of Latin American culture and tradition with a range of poor indigenous communities and weekend homes for the very rich). Thus, Tepoztlán hosts all types of spas, alternative healing, yoga retreats and has a typical yet, new-age feeling without being overly touristy and surrounded by impressive mountain vistas. You will feel totally relaxed upon arrival and feel re-energized upon departure. The weather in early February is warm and mild about 14-17 degrees. Arrive early Sunday, and you will catch the local market in the Zocalo — Central Plaza — visit the nearby the Ex-Convento (with 2 museums and art exhibits) or hike up to the nearby Tepozteco Pyramid. The retreat (La Quinta Tonantzin) located in Tepoztlán (Prolongación Tenochtitlán #56. Barrio de Santo Domingo. Tepoztlán, Morelos. C.P. 65520 ) is in walking distance of the Plaza Central. Starting Sunday afternoon after lunch, modest and comfortable shared accommodations with your own bathroom await you with a nice inner garden courtyard. The facilities are elegantly built and it has 2 gardens. Access to jaccuzzi (temazcal). Meals are homemade and delicious and you will have the opportunity to taste local dishes, homemade tortillas and spicy salsas. Access to free Wi-Fi internet will keep you connected if needed. • Casa Socorro, Calle Cima 7, Barrio La Santisima, Tepoztlán, (739) 395-0948; Home-cooked meals available. • Meson Casa Amanda, centrally located with lovely back garden area with fridge and stove, Cell: +52-777-305-6234. Facebook: Meson Amanda. $35 USD /night, Address: Cuauhtemotzin# 2, Barrio San Miguel, Tepoztlan. 1) Hotel Casa Gonzalez, located in a central tourist section of the city with accessible prices (from $50 to $130 USD), not so far away from the airport. For further information and reservations, click on the hotel link. 3) Casa/Hostal Amigos, next to Plaza de la Republica. Mexico City Benito Juarez International Airport is located at the northeast of the city. After leaving the international arrivals gate, you can find Currency Exchange Houses and stores where to buy $30 peso Ladatel public telephone cards. Please call the Sarar Capacitación host to inform of your arrival. For further airport information, click on the airport link above. It is best to change currency at the airport after you exit with your baggage. Do not change money before or near the baggage carousel as the rate is notoriously low. 1) Take a direct bus from the airport to Tepoztlan with Pullman Morelos that depart from the airport at 7:00 am; 9:15 am, 2:15 pm; and 5:00 pm. Price: $15.00 USD. Ask at the information desk, location of the departing buses for Tepoz. 2) From the airport take a licensed taxi, about 20 minutes to Terminal de Autobus Sur Taxqueña and buy a bus ticket with “Pullman de Morelos / ADO” to Tepoztlán direct (only one hour; leaves every 20-30 minutes about 150 pesos or USD $10). 3) Once in the airport, go to the Information Booth to ask about the "Pullman de Morelos" bus company. Once you find the bus departure, buy the next single ticket to Cuernavaca (about USD $12 in the daytime or $15 at night time or $200 to $300 pesos); the trip lasts around 2 hours. Upon your arrival to Casino de la Selva Bus Terminal in Cuernavaca, take a taxi ($17.00 USD or $200 pesos) there to Tepoztlán. Make sure you have a printed version of how to get to La Quinta Tonatzin (next page) to hand out to the taxi driver. The trip should last no more than 50 minutes..
La Quinta Tonantzin is located at Prolongación Tenochtitlán #56. Barrio de Santo Domingo. Tepoztlán, Morelos. C.P. 65520. Walking/hiking shoes, thongs/plastic sandals, soap, towel, light jacket for the cool mornings, sunscreen, bathing suit, overnight bag for 2 nights in the community, comfortable clothing. 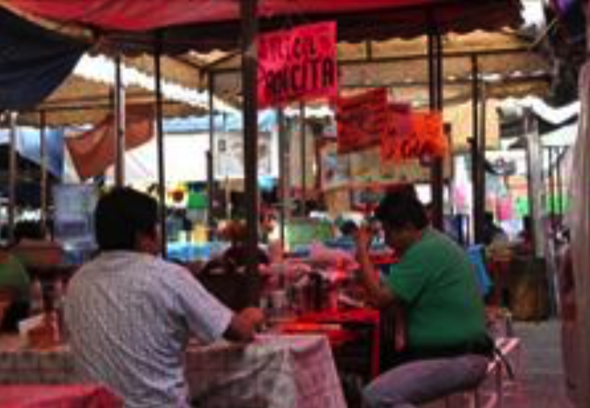 To know more about events in Tepoztlán: its restaurants, art and culture click here.